The Cactus Wren lives in the arid and semi-arid deserts of southwestern United States and the chaparral of southern California and northern Mexico. The Cactus Wren is usually found below 4,000 feet. The California chaparral has hot and dry summers and humid and cold winters. It normally gets about 6 inches of rain per year. eye. Their throats are white, and their beaks are dark, long and slightly curved. White and black streaks cover their backs. Their belly and sides are white to buff with dense spotting on the breast. The short and rounded wings have black and white banding. Legs and feet are tan colored. They are very active and curious birds. They quickly investigate anything new in their territory. If you leave your car windows down or the garage doors open they are sure to enter and check it out thoroughly. Cactus Wrens like to breed in successional chaparral scrub (chaparral that has recently come back from a burn). The female will select a nesting site in low, thorny trees or shrubs. In the Sonoran desert they prefer the well protected branches of the chain fruit cholla. Both male and female help build a football-shaped nest of dry grasses lined with feathers or other soft materials. A small side entrance protects the nest from predators. Cactus Wrens will first breed from February to early March and continue to have more broods through June if conditions are right. Four or five buff colored eggs speckled with brown are laid at one time. The size of the clutch (amount of eggs laid) is determined by the food supply. This is an adaptation Cactus Wrens have made to the changing food availability in their desert and chaparral habitats. The female incubates the eggs for 16 days while the male builds several more nest throughout his territory for roosting and future nesting sites. After the eggs hatch both parents will feed the hatchlings. The young fledge, or leave the nest, in 19 to 23 days. The fledglings stay with their parents for about a month. Cactus Wrens don't migrate and are considered permanent residents of the region they live in. Males will vigorously defend their territory throughout the breeding season. They sing territorial songs, although the songs are not very musical. The song consist of a one-pitched monotone of chuh,chuh, chuh, chuh, gaining speed towards the end. The Cactus Wren mainly eats insects like ants, beetles, grasshoppers, wasps, fruits, seeds, and and sometimes a treefrog or lizard. It will sometimes eat seeds and fruit. It has adapted to its hot habitat by shifting its foraging behavior according to the temperature. It begins to forage on the ground, and in the branches of shrubs in the late morning. As the temperature rises it will shift its foraging to shady, cooler areas. They stop foraging during the hot afternoon and rest in a shady area. They get almost all of their water from the food they eat. The California chaparral, home to the Cactus Wren on the west coast, is quickly disappearing because of development and urbanization. Only small patches of true chaparral are left. Most of the remaining chaparral isn't large enough to sustain a Cactus Wren population. Cactus Wrens prefer the low, thorny bushes and scrub of the chaparral to build their nests because it protects their broods from predators such as snakes. The Cactus Wren is very adaptable to changing environments, as long as native chaparral plants are provided to build its rather large nests in. The Cactus Wren is not considered endangered or threatened throughout its range. However, like all songbirds, it is protected by the Migratory Bird Treaty Act. 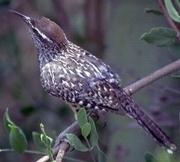 "Cactus Wren", http://www.scenicdrive.org/cgwren.htm, (May 5, '02). McCarthey, Tracy D. "AZGF Nongame Field Notes - Cactus Wren", http://www.gf.state.az.us/frames/fishwild/ngame_c.htm, (May 5, '02). Peterson, Lara. "Campylorhynchus brunneicapillus (Cactus Wren): Narrative", http://animaldiversity.ummz.emich.edu/accounts/campylorhynchus/c._ brunneicapillus$narrative.html, (May 5, '02).